We are a small team of developers led by Tyler Guillen, who met through Launch School and decided to work on a project together. Tyler is looking for work in the San Francisco Bay Area! Point your browser to his website to check him out! We set out to make a fast and easy way for a developer to keep a finger on the pulse of their web application, with minimal configuration and setup. Several pots of coffee later, Tracebin was born. This is the story of the development process of Tracebin. Footprint: We wanted to be conscious of our application’s footprint, both in terms of memory usage, as well as runtime dependencies. With that in mind, we wanted to only load components that we need (as lazily as possible), and code as close to the metal as we can. Ruby clearly isn't the best language for this, but there is definitely some room for a native extension if Ruby proves to be too heavy after a while. Performance Impact: Obviously, we don’t want a tool that measures application performance to have its finger on the scale. Therefore, as a rule, we wanted our agent to handle most of its administrative tasks asynchronously. This includes loading and unloading data from storage, measuring system health metrics, as well as communicating with the server. Transparency: We wanted to create a set-it-and-forget-it style agent that doesn't require any extra engineering overhead to get it to work well. We studied multiple existing projects that address these considerations, adopting the solutions that worked best for our project's nature and scope. The nice thing about the web is that anything worth measuring comes in discrete units: the request/response cycle. The vast majority of the basic performance concerns for a web application involve the time it takes to process this cycle. Thus, we decided to focus on the primary parts of that cycle that affect its duration: template compilation (i.e. the response body) and database queries. We also provide a way for the developer to manually instrument other workflows, if the need arises. The general pattern for instrumenting a chunk of code is to sandwich it between two measurements of the current time. Since computers are fast, it's best to use a library that can measure it down to a fairly high degree of precision. Replace do_the_thing with your own chunk of code and congratulations! You've written your own instrumentation library. Joking aside, it honestly isn’t much more difficult. That’ll be the pattern throughout this exploration: most of the stuff that goes into an agent like this doesn’t require much code. As always, though, the devil is in the details. Side note: Ruby’s standard library has a Benchmark module which provides some additional details about the runtime of the process, but we’re going to focus on the basic start-time/stop-time pattern. For a web app, we want to wrap bits of code like that around three basic processes: the overall request/response cycle, database queries, and templating engines that format the body of the HTTP response. A naïve way to implement this would be to expose a public API that the developer can use to declaratively instruct the agent what components that the agent should be measuring. This is in fact what we do for any custom instrumentation that the developer might want to implement for things that we don’t support. However, this isn’t very elegant for a full-blown agent. We’d need to put bits of code like this everywhere in our web app. We’ll need to find a way to make this process much more transparent, which means we need to move that code closer to the components we’re measuring. Furthermore, we’d also want a way to get additional information about that process, so this will require some extra logic outside of the start-time/stop-time pattern. Based on what we’ve discovered looking at other agents like the one we set out to build, this can be done in three ways: instrumentation libraries, middleware, and patches. Rails gives us some useful tools to measure different components of a Rails application with ActiveSupport::Notifications. Baked into Rails are “notifications” for many of the major components, like ActiveRecord, ActionView, and others. We just need to subscribe to those notifications and give them a callback to collect their data. ActiveSupport::Notifications is actually very extensible, and can be used to plug into just about anything in a Rails app. We decided not to take this route, because (1) it would require us to write the same code that we would’ve written for other components, with an additional layer of complexity; and (2) more importantly, it would require a hard dependency on ActiveSupport. Even for Rails, ActiveSupport::Notifications doesn’t cover every important Rails component. For example, the ActionView instrumentation that it provides will measure templates and partials, but layouts (which are sometimes the slowest parts of the process) don’t have a notification built in at the time of writing. Notification libraries are a useful abstraction for what we’re setting out to accomplish, and Rails’ built-in library has provided a great deal of groundwork for the patterns we’ve implemented throughout our agent. Some popular libraries have middleware frameworks that we can plug in to, allowing us to wrap a process with timestamps and gather information from it. Rack is the main middleware framework that we use, but some other libraries adopt a similar pattern, including Sidekiq and Faraday. Notice how we can collect information from the env variable as needed. Find the method that executes the code that you want to measure. For example, the pg gem for connecting to a PostgreSQL database calls the PG::Connection#exec or #exec_params method whenever it passes a string of SQL to the database. Open up the method’s class (we like to use class_eval for this, but it can be accomplished through other means) and alias the method out. This isn’t exactly how we implement our patch for PG::Connection#exec, but it’s the general idea. It’s important to make sure that this method returns what the original method was expected to return, or else we’ll wind up with some unintended consequences. We’ll explore how this information gets processed later on. Once we’ve implemented our instrumentation, we just need to tell the library where and how it should be installed. We want to cover as much of the application that we can cover while avoiding redundancy. If we instrument ActiveRecord, we don’t need to patch the underlying database connection. To accomplish this, we make several defined? calls for various libraries and filter out the instrumentation we don’t need. Now that we’ve found a way to gather information about the components we’re interested in, let’s find a way to bundle it all up so we can send it to our server. First, let’s get some terminology out of the way. We refer to a full request/response cycle as a “transaction.” A background job is a transaction of a different type. At the time of writing, these are the two varieties of transaction supported by our agent and server. Anything that happens synchronously during the execution of a transaction is referred to as an “event.” This includes database queries, template rendering, and so on. Most libraries that we’ve seen build its measurements of a transaction in a nested, graph-like structure. When an event starts, any other event that occurs during its runtime gets added as one of its children. A pointer keeps track of the currently running event. When the event ends, that pointer is moved to the event’s parent event. When the “root” event ends (i.e. the transaction, in our terms), we process the data. The main advantage of this model is we simply need to iterate through its structure depth-first in order to follow the execution flow of the transaction, since the data is already sorted by the time at which the event occurred. Furthermore, each transaction is bundled in a neat package for easy data transmission. It also allows us to more easily detect n+1 queries and other repeated operations. The major drawback that we’ve identified with the nested-event model is that it limits the queryability of the data. Similarly to many NoSQL databases, this data structure enforces a specific set of query paths, and are inflexible and inefficient for queries beyond that set. Want to find all events of a certain type that happened during a transaction? With a nested, tree-like model you must perform a full, iterative search through the entire data structure. Of course, we can get around this by reorganizing the data when we deserialize it on the server side (something we suspect most services do—NewRelic indeed uses an SQL database to store their agent data). Rather than a fully-nested data structure, we instead store our events in a flatter, two-level structure. The full transaction acts as a “root node,” and all events that happen during the transaction are stored in an array. Events are pushed onto the array as they finish, thus they end up in a quasi-sorted order. This structure provides a slight performance advantage when the data is deserialized, but will require slightly more computation when we go to trace the execution flow of the transaction. The main advantage with this model, however, is its ease of implementation. Just shovel each new event onto an array! Events must be organized so that those that occur in one transaction don’t contaminate other transactions. 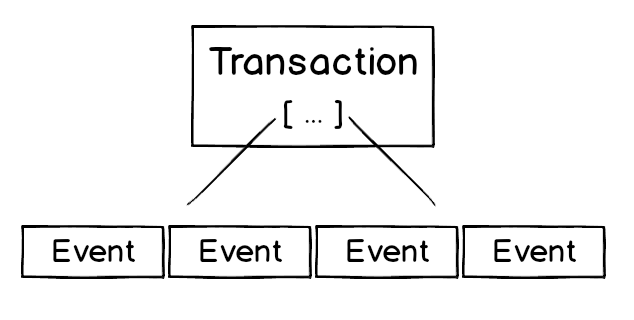 If transaction A and B are being executed simultaneously, event a occurs in transaction A, then we don’t want it to be added to transaction B’s events array. When we collect a transaction and its event data, that process must be thread-safe, since multiple threads are sharing the same “master” resource that merges them together. The first concern can be addressed with thread-local variables. This is simple to do with Ruby: Thread.current is a mutable hash-like structure to which we can add arbitrary key/value pairs. The value for any given key is distinct for each thread, and threads cannot access each other’s current object. Nearly every agent we found addresses the concern this way. To address the second concern, we take two steps: first, we join data from all threads at a single point. This minimizes administrative load, so we can focus on thread safety for one piece of logic. Second, we take advantage of our project’s sole runtime dependency, concurrent-ruby. With it, we get several abstractions for various common concurrent operations, including thread-safe wrappers for Ruby’s core data structures. We use concurrent-ruby’s Array wrapper for this. Whenever a transaction completes, all data collected gets added to this array, which is locked while it is being mutated. Therefore, we can treat it just like a normal Ruby array without worrying about adding extra logic. With that in mind, concurrent-ruby provides an abstraction for thread-local variables that we don’t use at the time of writing, but this would be an easy component to adopt. The naïve solution is to open a new HTTP connection and transmit the data at the end of each transaction. This would allow us to abandon the need to store any of the data, since it gets sent off as it is generated. Handling this synchronously would affect the overall performance of the application, since the time it takes to open a connection, send a request, and handle the response would be “in-line.” With this in mind, we would at least need to handle this in a separate thread (concurrent-ruby provides several solutions for this). There are several problems with this approach. First, since HTTP requires significant overhead, we would easily begin to overwhelm the machine if it receives even a moderate amount of traffic, even if we perform these actions asynchronously. We’d also start overflowing the available thread pool very quickly, and our server would experience heavy traffic as well. The next solution (which is actually the one we decided to implement as a first iteration of our agent) is to store the data in memory and schedule an interval at which it is unloaded and transmitted. This way we can space out our connections to be certain that we can minimize computational overhead in both the agent’s host process, as well as our server. Currently, our agent accomplishes this using concurrent-ruby’s TimerTask object, which executes code from a block on a set time interval. This occurs in its own thread, so we don’t need to worry about interfering with the application’s normal flow of execution. This may not be the best possible solution for applications that receive hundreds or thousands of requests per minute, as transaction and event data are held as objects in memory, and may eventually use up a great deal of memory as requests are processed. This problem may be curbed by setting a configuration variable to transmit the data more often, but it may end up causing the same sort of problem we saw from the previous solution of sending requests to the server too often. To address this, we considered putting a cap on the memory footprint of a given set of transaction data, transmitting it to the server when it grows past a certain point. This addresses the memory footprint problem from above, but it may be less optimal for less active applications. An application that receives one request per minute might seldom reach the size cap we set, and therefore the dashboard for that app will rarely be up to date. It seems, then, that the best way to get around this is to use both time and size triggers, transmitting a payload whenever either is reached. Tracebin’s agent currently does not do this, but it is a future consideration. While we were developing the agent, there were a several interesting problems that we came across that we needed to tackle. Here are a few, and how we solved them. Most of Tracebin’s patches and subscriptions work by detecting whether the top-level namespaced constants are defined. For example, we know that we can patch the pg gem if defined? ::PG returns a truthy value. In some cases, we might add some additional logic to ensure compatibility, but this seems to be the standard practice for libraries that want to interact with other libraries. These checks will only work if our library loads after those other libraries are initialized. This means that if we run this code right when our library is required/imported (Bundler imports all gems from the Gemfile right away be default), we will not catch the libraries that are included after our gem is listed in the Gemfile. It isn’t a very ideal situation, since we would need to instruct the developer where to put our gem. There are a few ways to approach this issue. We’ve seen some existing tools patch Kernel#require, Ruby’s library import method, to patch libraries as they are imported into the application. Others will run several checks throughout the lifetime of the application for patchable libraries. We chose a slightly different approach. Since our agent, at its core, is a Rack middleware, we decided to run those checks when it is included in the rack. This is done automatically on a Rails application (via a simple Railtie), but will be needed to be manually done in other frameworks, such as Sinatra. This way, we can be sure that all the files we want to patch have already been included. The downside to this approach is that we forgo compatibility to any possible non-Rack framework. Most production web servers, such as Puma, Unicorn, and Passenger, run multiple worker processes to help handle many requests at once. These worker processes are initialized (or “forked”) after the application process starts, but before any requests are handled. After this fork takes place, any variables initialized before the fork are inaccessible to the worker processes. This presented an issue, since any transaction data generated by those worker processes end up being inaccessible to the “reporter,” the class responsible for transmitting the data to the server, because it was initialized in the parent process. Most web servers offer a “after-fork” hook that allows the developer to let the application wait until after the workers fork before executing some code. However, this would require a certain amount of monkeypatching, which means adding an additional degree of specific, declarative support for specific versions of these libraries. While support like this isn’t completely off the roadmap, we decided to go a different route. Our approach was to create an additional “reporter” object for not only the parent process, but for each child process as it spawns. To do this, we added some initialization code in a place that we knew wouldn’t be executed until after a worker spawned. For now, that place was the #call method of our Rack middleware, but we are considering other places as well. The core functionality of measuring application components does not require much code at all. concurrent-ruby is an unmistakably better alternative to the low-level APIs that Ruby has built in for multi-threaded workflows. It catches the language up to other languages that offer better abstractions for concurrent functionality. This is something that the core Ruby libraries are lacking. It is very important to pay attention to when and how a library’s code is executed during the lifetime of its host application. Concurrency adds an additional level of complexity to this consideration. However, we decided to stick with SQL—namely, PostgreSQL—for the current iteration of our service for the following reasons. First, since our app revolves around finding ways to query our data for analytics, we want to optimize for queryability. PostgreSQL’s robust set of features especially shines in this respect, with numerous datatype options and robust extensions ecosystem. With virtual tables, SQL provides us with a more intuitive mental model for understanding our datasets, and it allows us to conjure up data based on what we need. PostgreSQL itself also gives us a little more flexibility on how we choose to represent our data. This will prove especially useful later on in our exploration. Here’s the big takeaway, which has been the main theme for the database decisions we’ve made throughout this process: we want to store the data in a way that lends it self to how we plan to query it. Not only do SQL databases provide us with several additional degrees of freedom for the kinds of queries we plan to make, but they, especially PostgreSQL, allow us to perform more complicated aggregate operations closer to the database than other solutions. 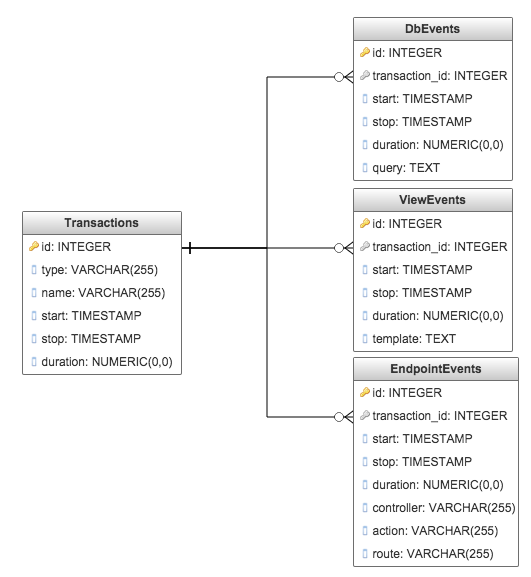 The events column stores an array of JSON objects, each of which contains all the data related for the event. With this, we end up with what is essentially a NoSQL datastore. We can’t perform direct JOINs and aggregates on that JSON column, which means the data we’re trying to obtain may be difficult. Thankfully, there are several functions in PostgreSQL that help us to convert JSON structures into virtual tables, which we do end up doing with some endpoints. One potential hazard with this model comes from the fact that we have the same data represented two different ways in two different places. This would be a major problem if we go to mutate this data, but these tables will not be used in this fashion. They will be written to once, and never modified. We must accept some additional tradeoffs with this model, and we’ll discuss these in the next section. One consideration to make when choosing how our data should be transmitted is computation location and strategy. To understand this challenge, let’s go back to our mantra: data must be persisted to reflect how it will be queried. The raw data collected by our agent comes in pieces that aren’t extremely useful for presenting our data. For instance, name and duration must be computed, since they aren’t present. Any computed data like this must be computed on either the side of the agent or the server. Since we don’t want to impact the host application’s performance with extra computational tasks, we let the server handle most tasks, with the exception of computing duration and type, both of which can be completed synchronously in a reasonable amount of time. To illustrate, let's see how to get each column for the endpoints table. The first four are fairly simple since, per the schema we illustrated above, we can pull those values straight from the the columns in the database. The "% App", etc. columns are a little more tricky, and it might be useful to understand what they represent. For a web app, it's useful to know how much of a transaction is spent in each layer of the application. For example, we might spend just a little bit of time in the application itself, while the majority of time is spent rendering the view. These percentages will help us to show these characteristics at a glance. Pulling them directly from the database might be difficult, but we can instead compute averages in a query, and then compute the percentages on the application layer. Before the JSON object for a transaction's events is persisted, we do a little bit of organizing by type so that we don't have to iterate through the events at query time. 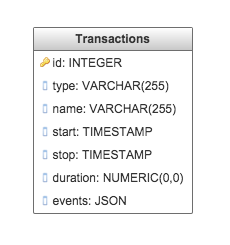 Because of this, we can just run events->'sql' in our query if we want all of the SQL events, and so on. We probably didn't choose the best name for this key, since this is where all database queries would go, including NoSQL queries, but we can definitely change it later on. We can use PostgreSQL's jsonb_to_recordset function (we're using a JSONB datatype, since it's much faster to query, and we can add indexes to values nested within it), which allows us to pull a JSON object's key/value pairs as a virtual table, with the keys represented as the columns. Since we're only interested in the duration, we can simply pull that value, and then sum up the rows. We then need to average those values over our entire dataset, so let's add it to our query. 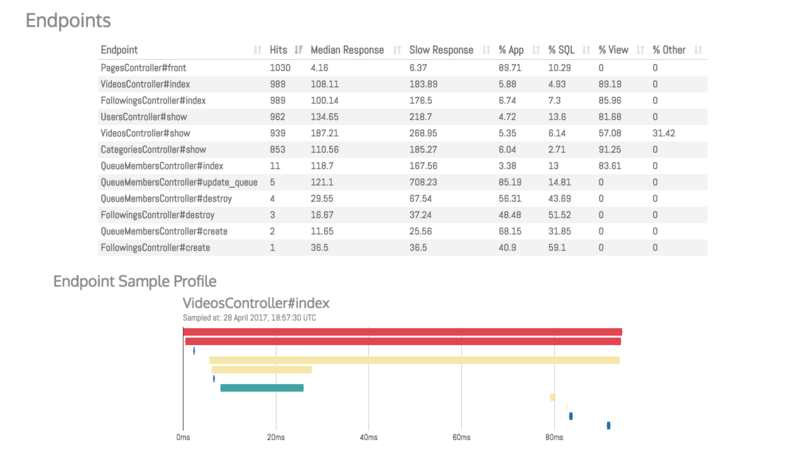 We need to some additional computation with the "View" column, since it may be the case that SQL events happen while a View event is running. For that, we just need to subtract out those SQL events.